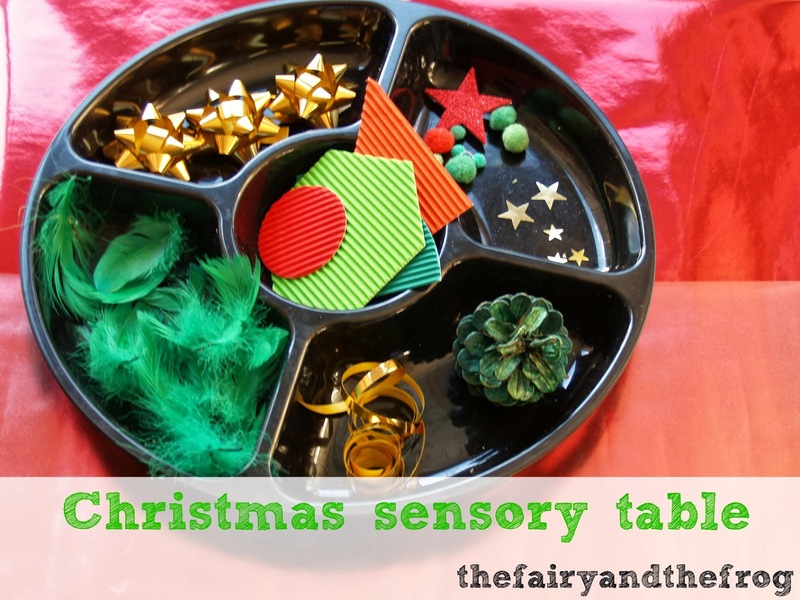 This fun sensory table is a great way to have fun with things that you'll have have lying around the house at this time of year. 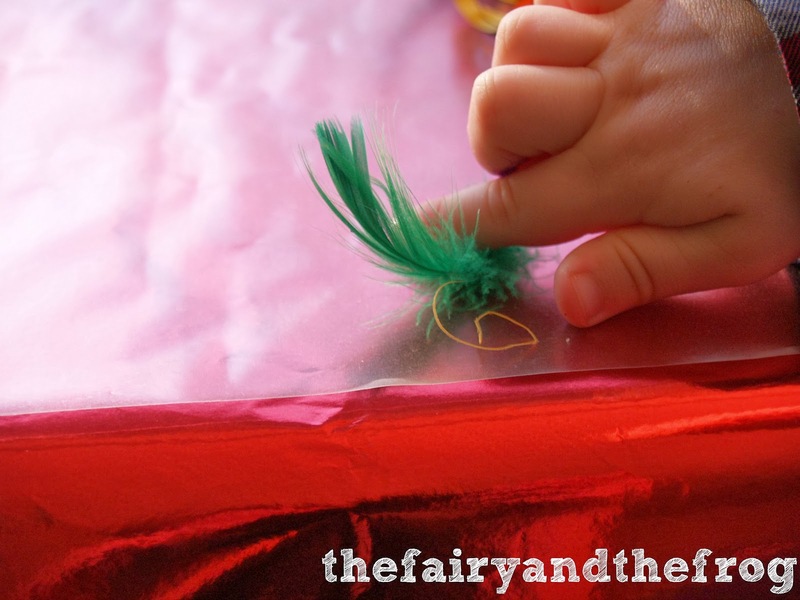 It's a great way to keep kids entertained before they get their presents! I set up a table with some Christmassy bits and bobs. I used a snack tray to separate the items out and make them look more inviting. I tried to include a range of textures (all in Christmas colours). 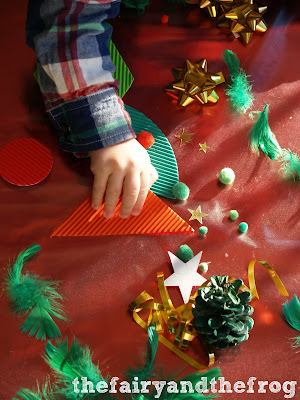 You could include what ever you have and are happy for your child to play with. All our decorations are potentially breakable but if you had some sturdy ones you could add them too. I covered the table in wrapping paper added some sticky back plastic (contact paper) to the table sticky side up to hold the items in place (this is an optional extra you could still play with the items without this). The Frog then arranged and re arranged the items for ages. It was lovely to see him concentrate on an activity for a prolonged period because like most 2 year olds his attention span can be short. He loved putting similar items (e.g. pom poms together) and then rearranging them. 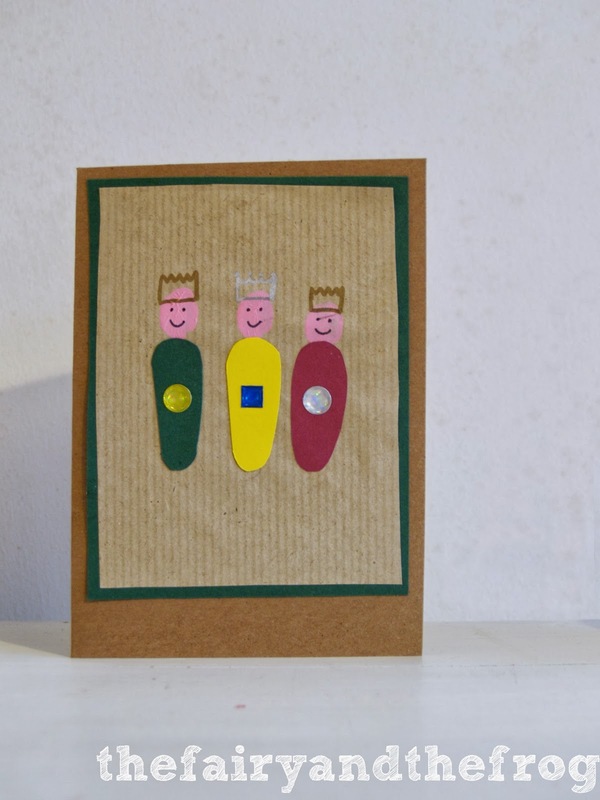 Have you got your Christmas cards yet ? 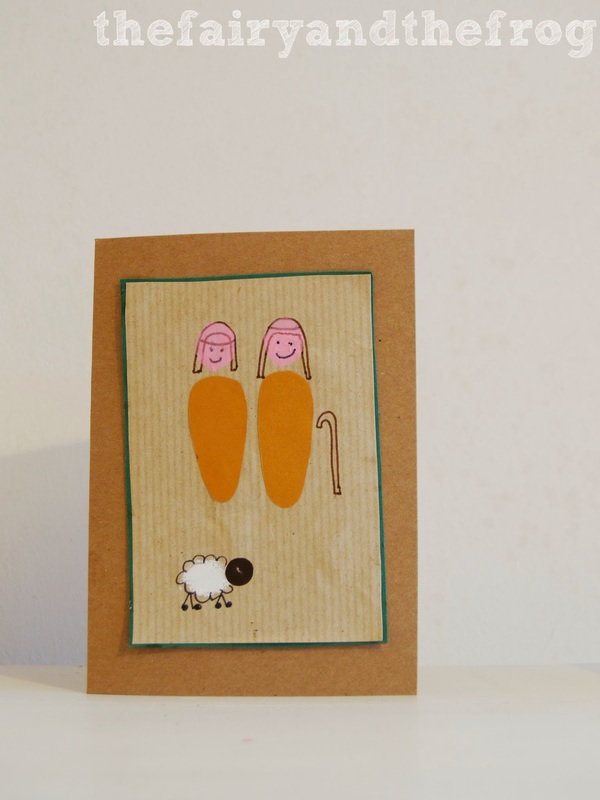 We've made some handmade cards based on the nativity story. 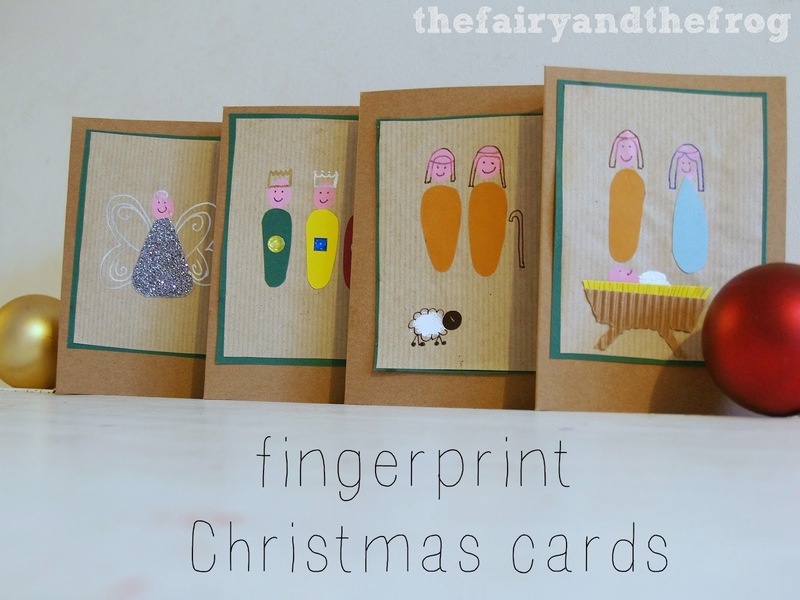 The base of the card is really simple - a fingerprint. We're quite big fans of hand print / finger print art (as you can see from our autumn tree, spring tree and handprint birthday card). After a finger print we added different details and embellishments to make the different characters in the story. For Mary and Joseph I added a brown and blue body as well as head scarf. 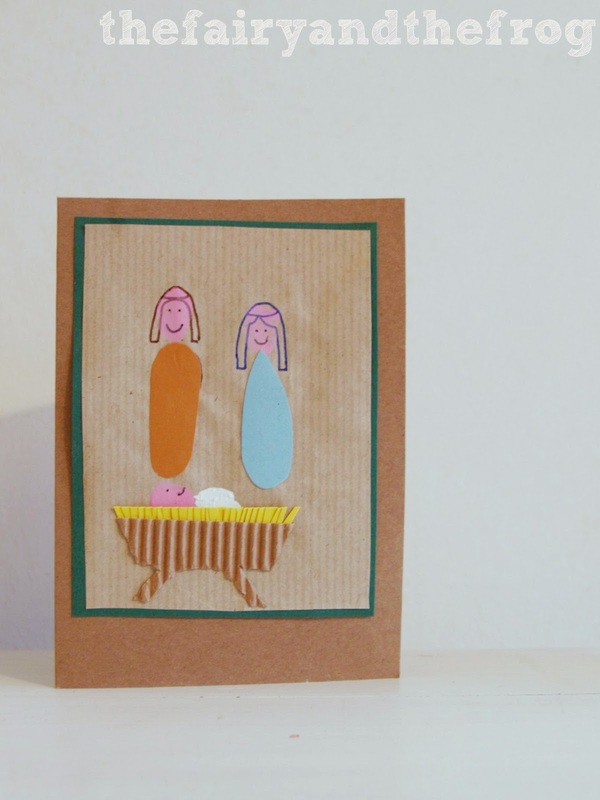 Baby Jesus had a bed of straw made from cutting a fringe into a piece of yellow a.d a crib made from corrugated card. 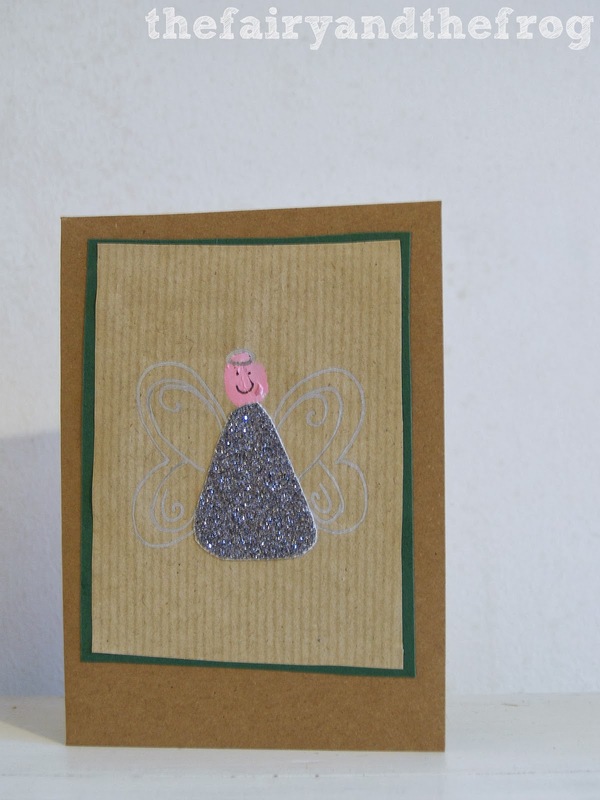 The angel had silver wings (drawn on with one of these markers - which I love http://www.amazon.co.uk/Pilot-Silver-Marker-extra-point/dp/B0017TMLAK) and a body made of glittery card. 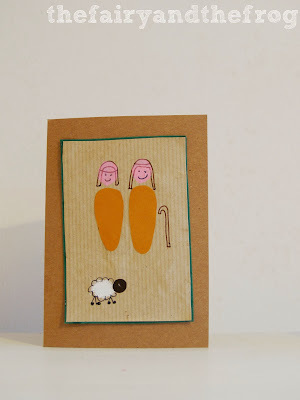 The shepherds had bodies similar to Joseph and a white finger print which I turned into a sheep. 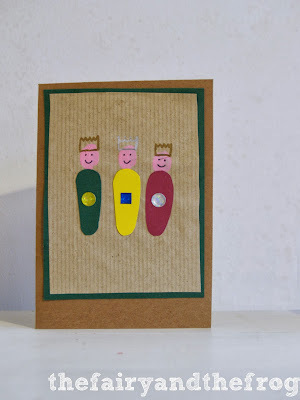 Finally the wise men had brightly coloured bodies, hand drawn crowns and stick on sequins for gifts. 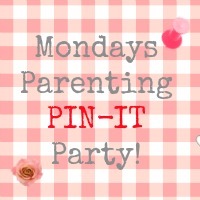 Its Monday again which means its Parenting Pin it party day and this week I'm hosting. If it's your first week welcome! 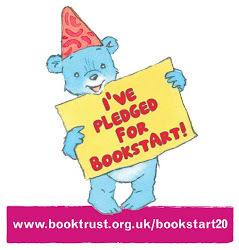 We hope you'll find lots ideas for activities and parenting tips. If your a blogger we hope you'll join in and link up. As I'm hosting I get to choose some of my favourite posts from last weeks entries. 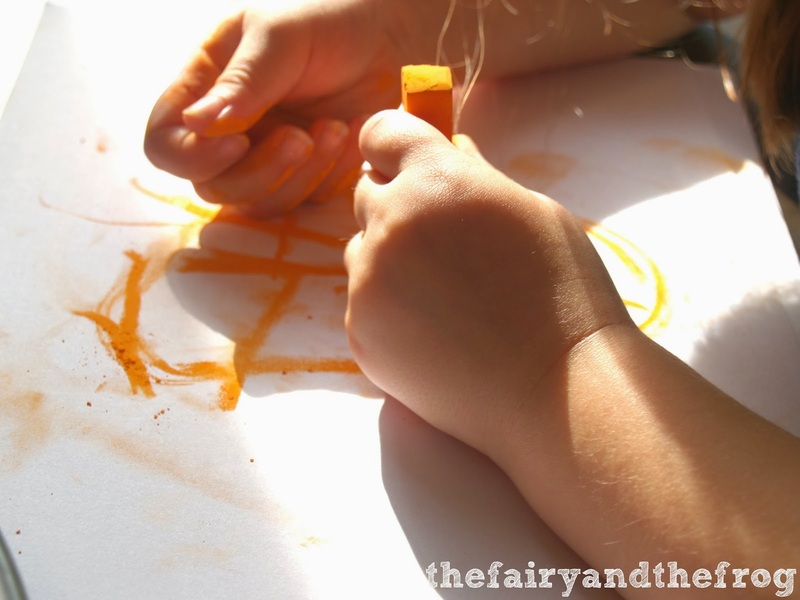 Regular readers of The Fairy and the Frog will know how much we love messy and sensory play. 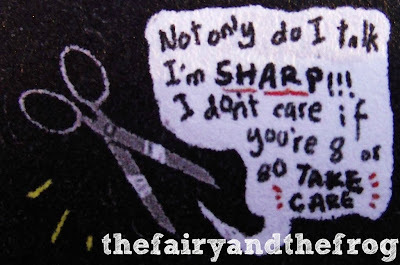 No surprise then that this post from princess and the grapie caught my eye. 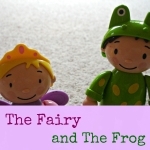 2) Make sure you follow The Monday Parenting Pin it Party pin board, it would be super lovely if you could follow The Fairy and The Frog on Pinterest too. 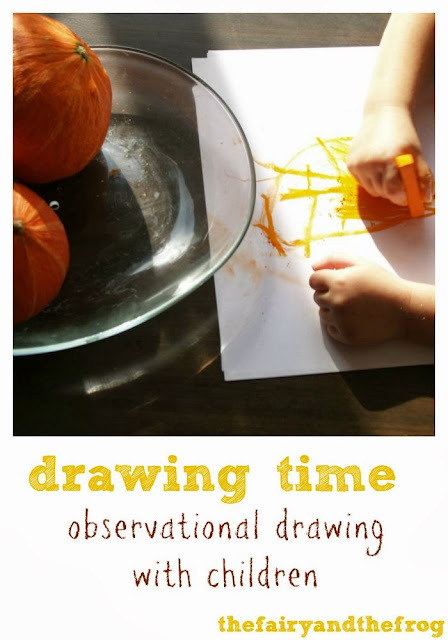 Exploring art is one way to tap into how your child sees the world and to encourage them to make observations of the world around them. I love the sweet little things that children say. Things that make you realise they don't always see the world the same way as you. 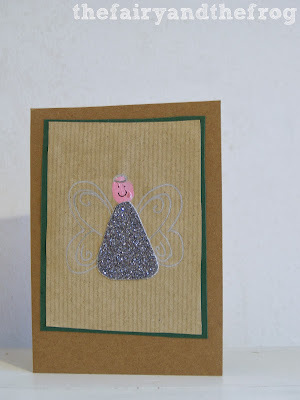 The Fairy calls INSET days (UK teacher training days) 'Insect days' (I like to imagine she thinking her teachers are learning about invertebrates!) Or the Frog shouting 'ball' when ever he sees anything round in the vegetable aisle at the supermarket. Drawing at the same time as the kids draw is really fun (it's a tip I have picked up from one of favourite bloggers Rachelle at Tinkerlab). 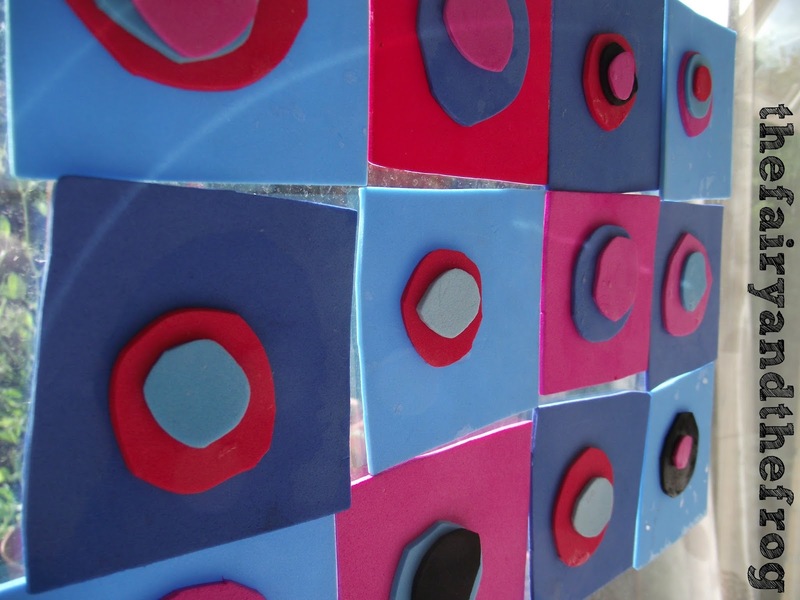 I really enjoy the shared experience of creating together. The kids seem more engaged and want to take part for longer. 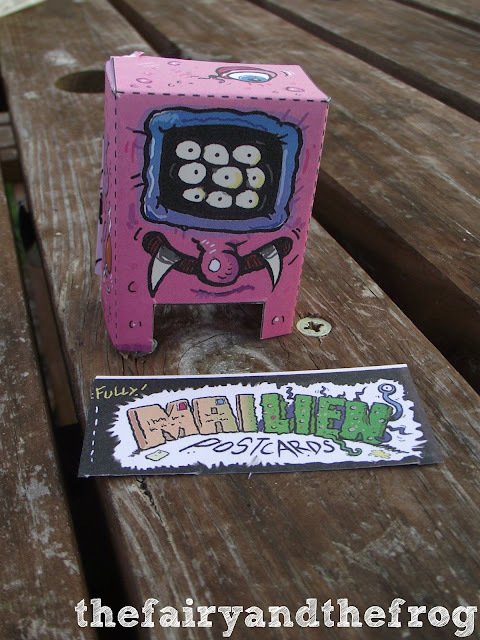 It's also a great way to model that art doesn't have to 'be' a certain way or to be perfect to have value. Earlier on this week the Fairy and I got out some chalk pastels and drew some squashes. Before we started I encouraged her to hold and feel the squash- talk about the shape and colour. 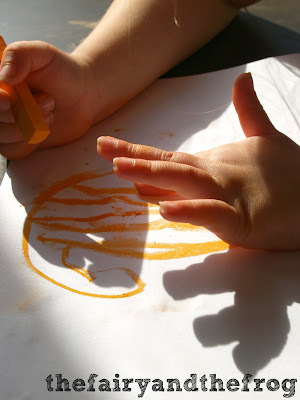 We talked about what other things were the same colour - oranges, sweets and her friend's hair. 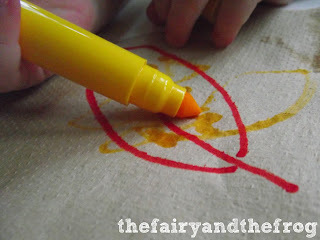 We then got drawing each with our own sheet of paper. 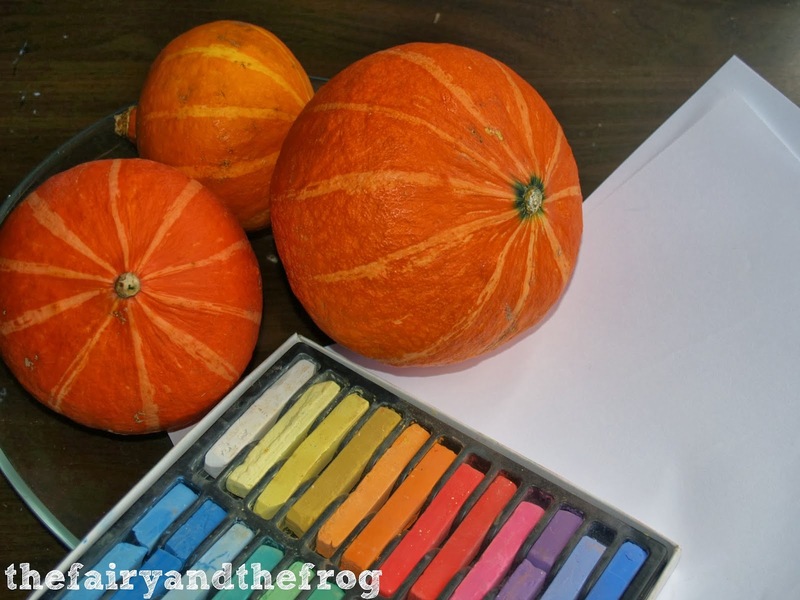 She drew 3 (very orange) squashes. 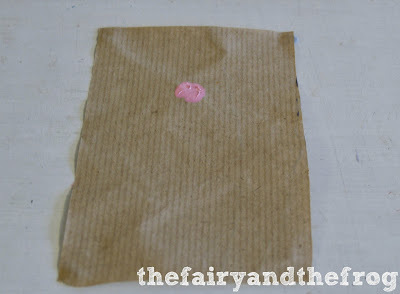 She loved smudging the pastel to mix colours. Unfortunately The Frog wanted to join in with the arty action when he got up from his nap and drew over all of our finished art work. I need to remember to put things on a higher shelf! 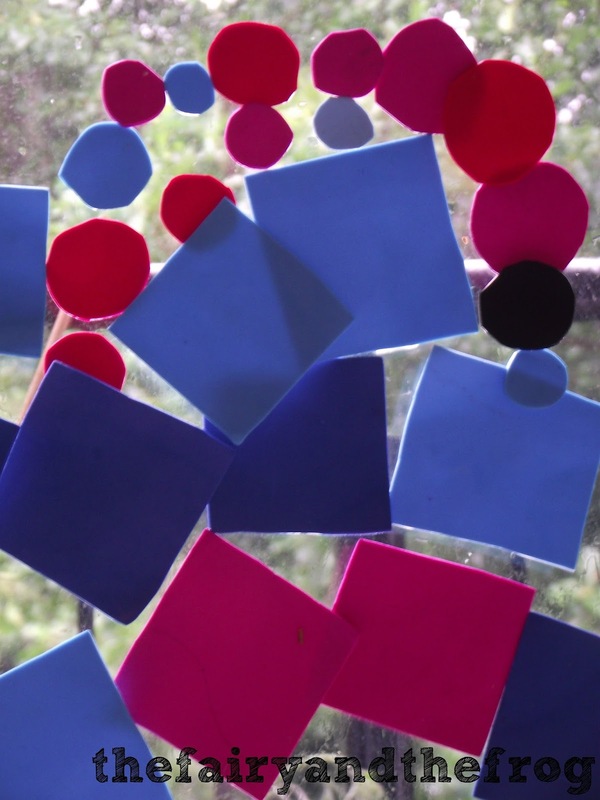 Language Links: colours, shape and size concepts. Developing comparative language (same as, different, like). 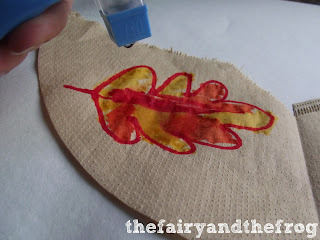 These gorgeous leaves are super easy to make and make lovely homemade fall/ autumn decorations. 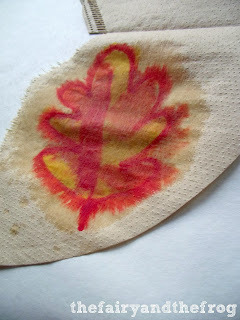 Then colour the leaf. We used autumnal (fall) colours to fit in with the season but you could use what ever colour you like. Next you spray (we used a well cleaned out bottle to hold the water). Using the spray is great for encouraging motor control in little hands. It helps if the leaf is on backing paper at this point as the link spreads(not kitchen roll as that will absorb all the colour). The Fairy observed the leaf looked more like a leaf (and less like a blob of colour!) if she used less water. 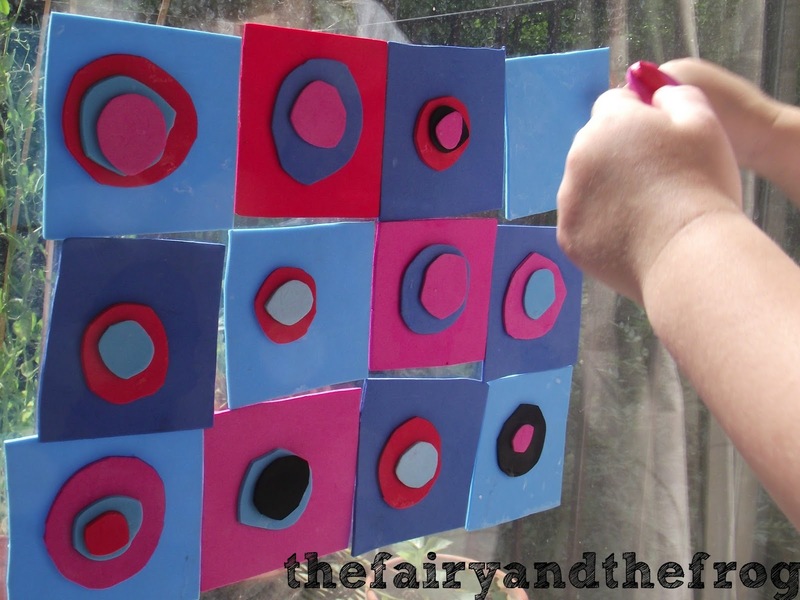 The Fairy was fascinated to watch the colours blend and merge. 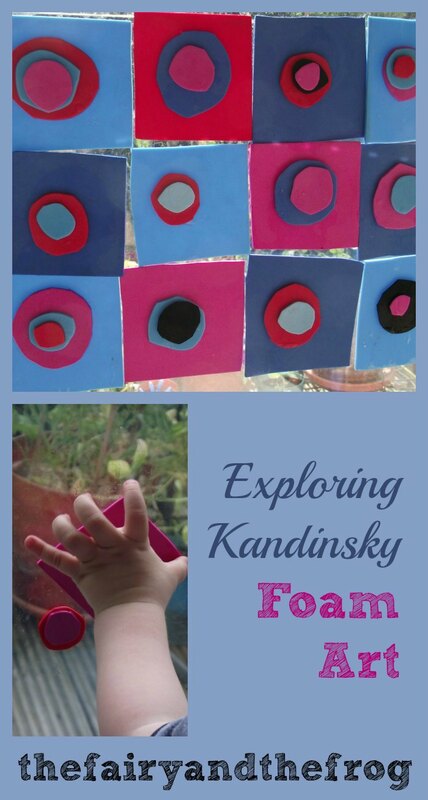 This activity was great fun as well as being a great learning opportunity. 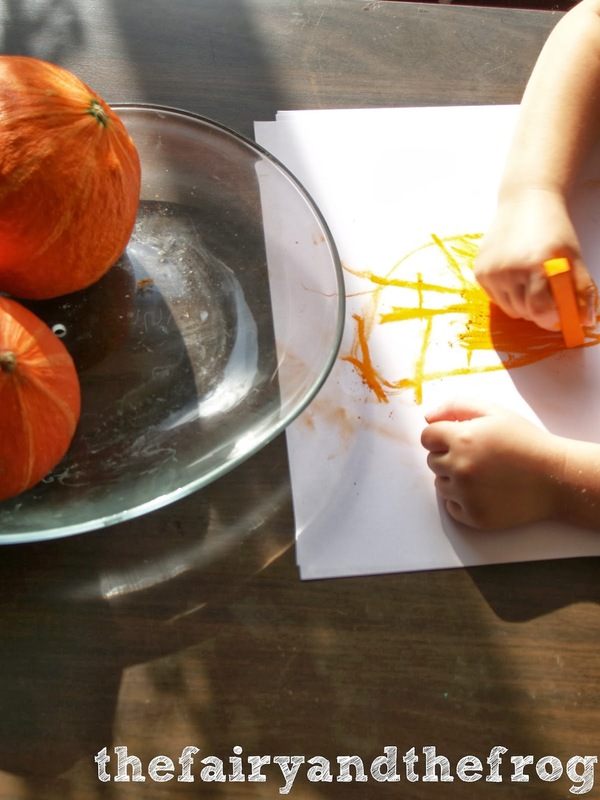 Not only could both the children (aged 2 and 5 years) do something together at the same time, they were developing fine motor control and making observations. It's my turn to host the wonderful parenting Pin it Party today. I love the bit where she describes how her daughter decides to rub the spaghetti on her feet. Children learn through their senses. Sensory play is a great way to have fun, develop the sense of touch and thinking skills, as well as creating loads of opportunities for communication and interaction. Each week a group of lovely bloggers get together to host the parenting pin it party. You can link up favourite posts and we pin them. 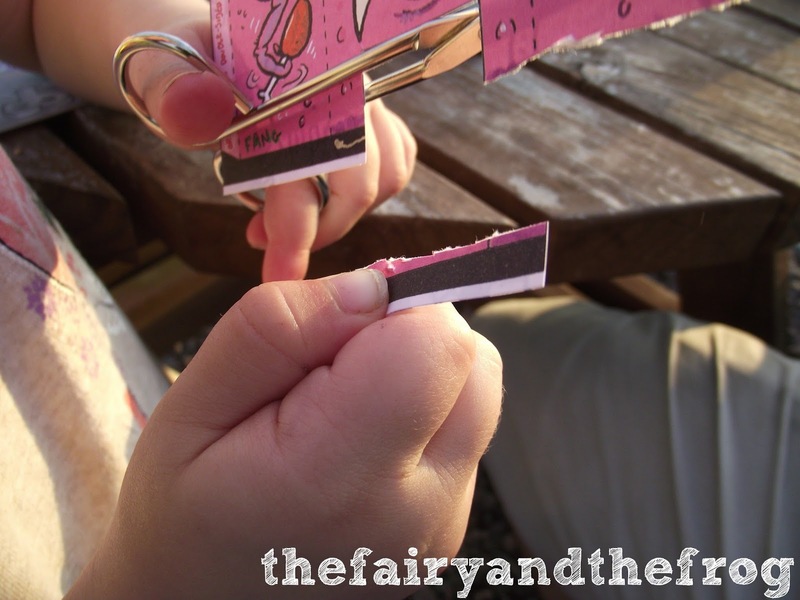 It's a great way to find lots of lovely ideas for kids activities and parenting posts. This week were hosted by the rather fabulous Mamasaurus. 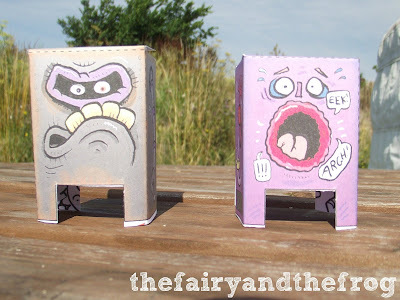 Pay her a visit to see what favourite posts from last week are. 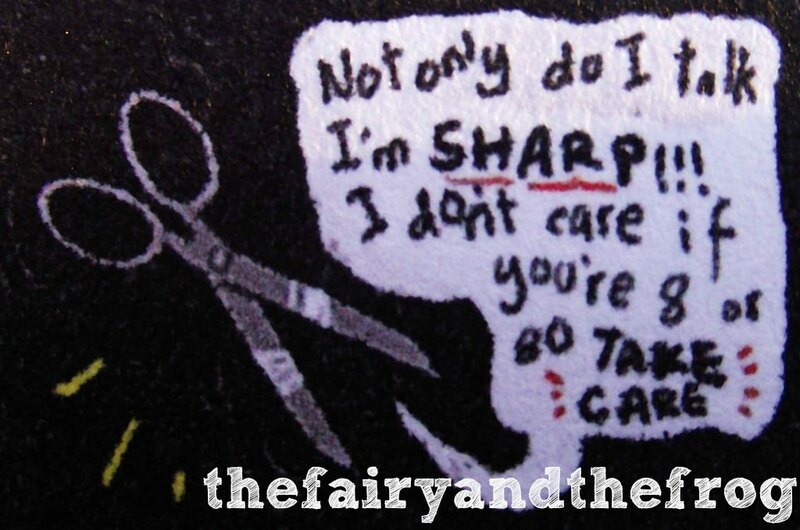 It's Monday again , which means it is time to share your fabulous parenting posts. Anything parenting related is welcome from crafts, play ideas, posts on parenting any recipes. 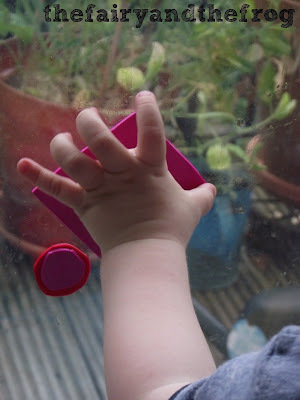 This week it's Mum of One's turn to host and choose her favourite posts from last week. Using objects as you tell a story can help a child to focus and pay attention. Having the same objects available for the child to play with can act as a prompt to help them retell the story and develop imaginative play scenarios. 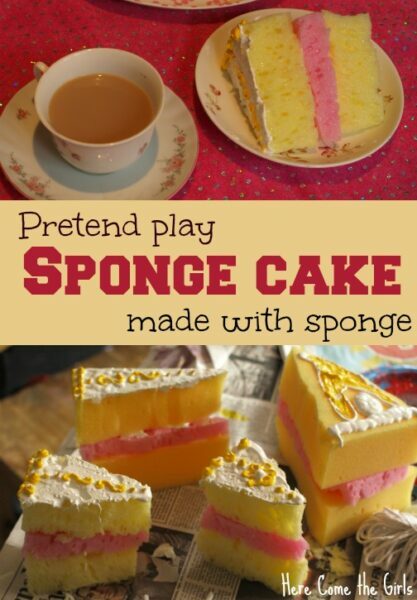 All great ways to develop language skills and have fun at the same time. I made some pom poms out of wool (my top tip if you are going to 'try this at home' would be to use smaller pom poms - I was a bit enthusiastic and they take ages to make!). 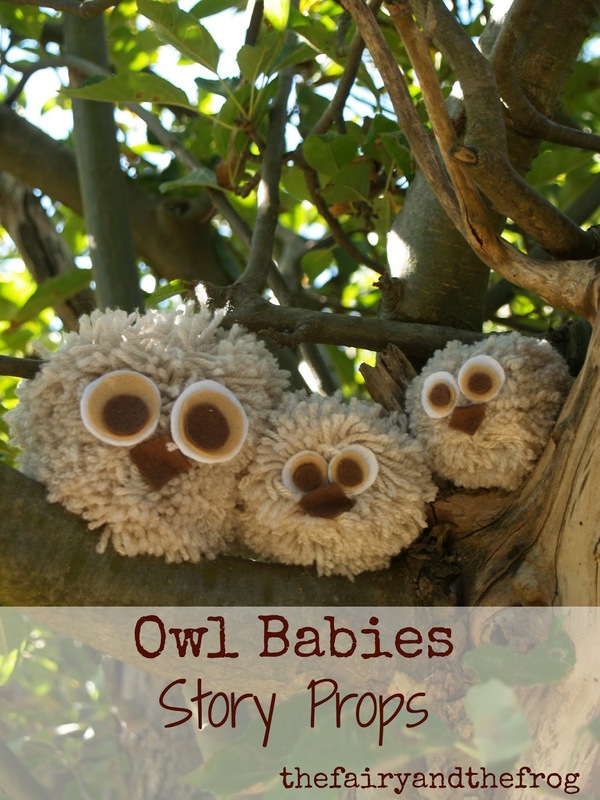 I made 3 'owl babies' and one wool mother. 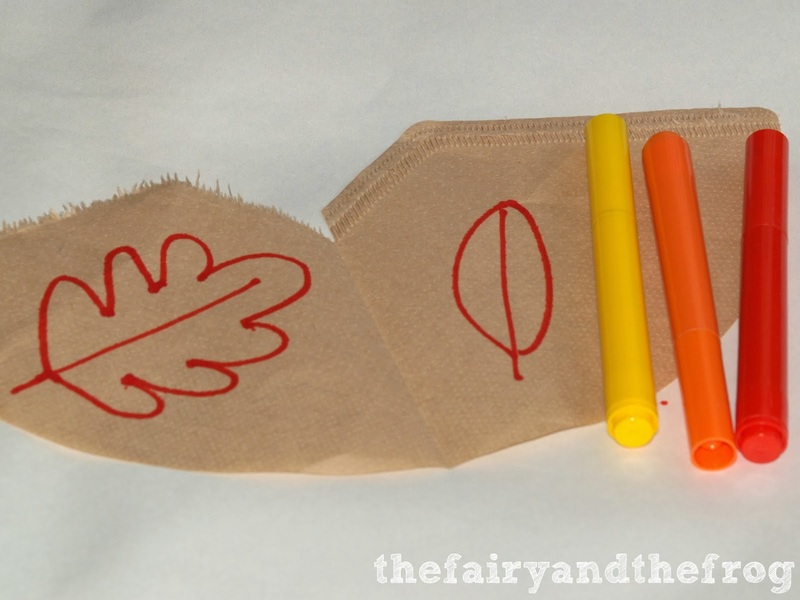 If you have an older child you might like to make the pom pom with them. I modified them to look like owls by sticking on some felt eyes and a beak (made from folding a square in half). I then told The Fairy the story (borrowing Grandma's apple trees for a nest). Moving the props as appropriate during the story. Afterwards we used a fallen branch and The Fairy retold the story. Later I over heard her playing 'Owl schools' - The eldest Owl had just started school like her! 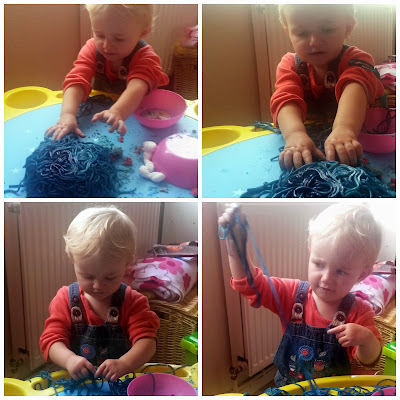 NB as these are pom poms not toys it is important not leave your child alone with them. 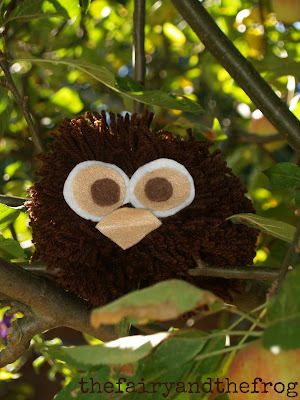 We talked about our pom pom Owl's over at Red Ted Art's Autumn craft hang out. There are lots of other lovely autumn ideas to check out. Today is Monday, which means its time for another Parenting Pin it Party. This week its the turn of Romanian Mum to host. Don't forget to join in! 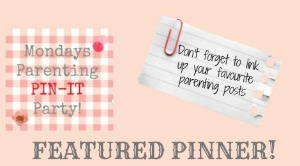 Today is my turn to host the parenting pin it party. As a host we get to choose our favourite of the post from last week. 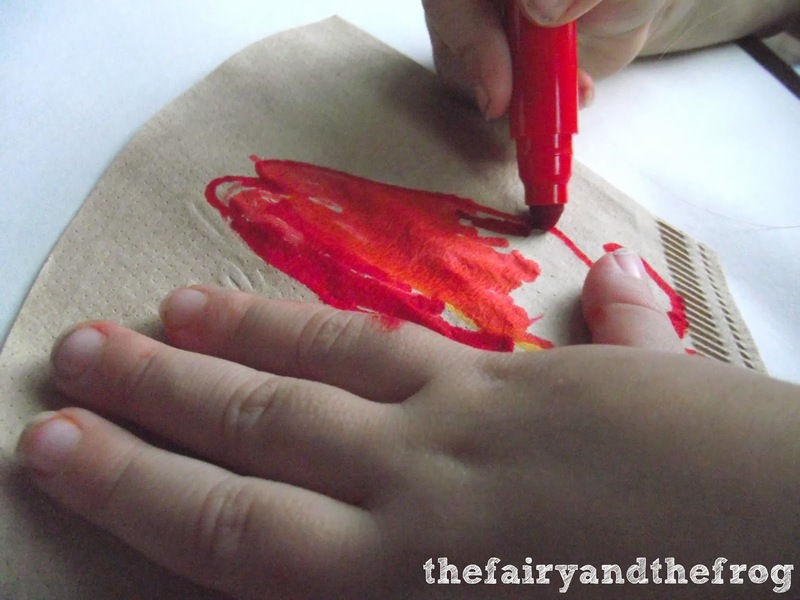 Regular readers of The fairy and the frog will know how much we love pretend play (keep your eyes pleased for an upcoming post we have on why pretend play is important for developing language skills). 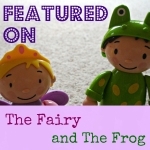 Considering our love of pretend play it's no surprise, then that this post from Here come the girls caught our eye. 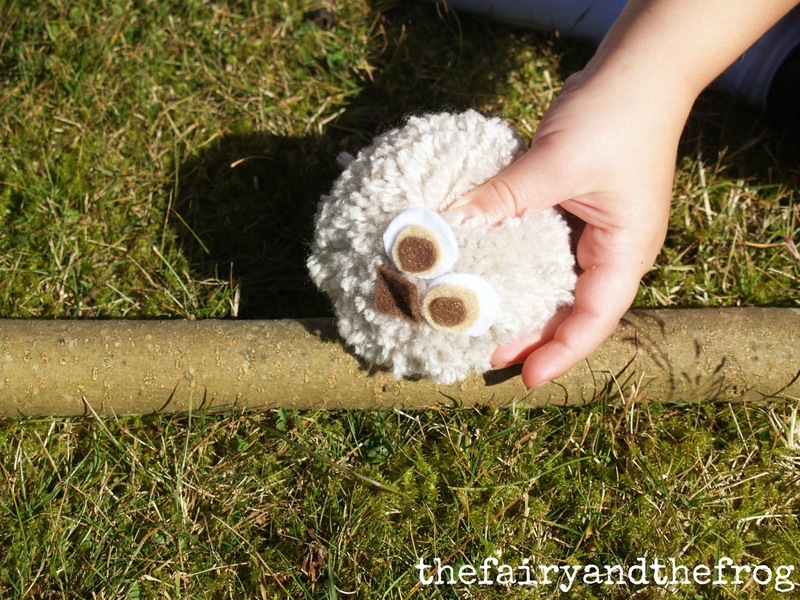 Another favourite of ours is incorporating nature and natural materials into learning. 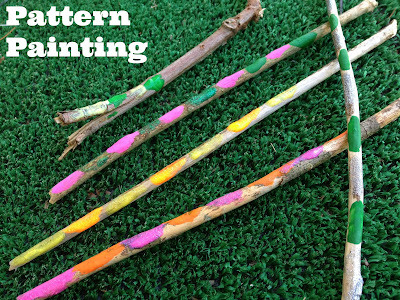 We loved this idea for making patterns on sticks from Tutus and Tea Parties. What have you been up to ? Don't forget to link up below. Please 'share the love' and visit other people's posts and leave a message or pin it. Ps you may have noticed we've been a bit slow with new posts lately- we're just enjoying some calmer quiet time before The Fairy starts school this week. Normal service will be resumed shortly!